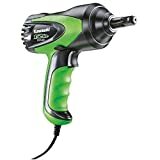 This is our brand new and professional electric impact wrench, which is designed for professionals who demand a tool for difficult fastening applications, such as driving and removing fasteners, nuts and bolts in wood, metal and concrete. Adopting superior craftsmanship and made of premium materials, this impact wrench is strong and durable. It has high twisting force and High rotational speed, improving your working efficiency. Buy yours today! The Kawasaki 12V Impact Wrench Set 841337 is perfect for emergency roadside tire changes. 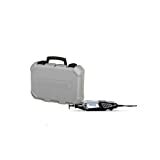 Always be prepared with this durable tool which plugs into a 12V DC socket and harnesses 190 ft-lbs of torque. Loosen and tighten vehicle lug nuts quickly and easily. Comes with 2 double-end impact sockets and a pair of 10A safety fuses. This Kawasaki tool delivers outstanding performance when you need it most. Designed for occasional emergency use. Not intended for heavy duty continuous use. 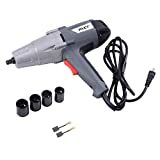 ROGTZ 1/2 inch electric impact wrench has rated power of 85 watt, 12 Volt with high no load speed. an isolated forward/reverse switch, and double sockets (17/19mm, 21/23mm). 1. Overload use is absolutely forbidden, in case of no load running, the max speed working is prohibited. 2. To ensure sufficient electricity, it is better to start the vehicle before actual operation. any risk of electric shock. 4. It is forbidden to operate in flammable and explosive places to avoid causing fire and explosion. (dc 12v), do not reverse the position. to manually rotate the nut. 7. Children are not allowed to operate electric car wrench or get close to the work place of electric car wrench. The Genesis GCOT335 is perfect for small projects that require cutting exhaust and other metal pipe. 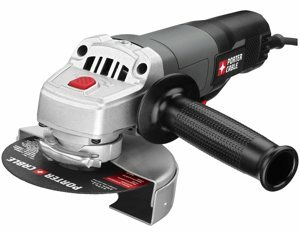 The 3.5 amp motor spins the cutting disc at 24, 000 RPM for performance you can count on. The tool free adjustable guard makes moving the guard fast and easy. Tool-less blades changes save time and money! With a maximum cutting depth of 1 inch and 3 in blade, you’ll make Quick work of your next DIY project! Buy with confidence with Genesis’ Two year warranty! Includes two guards for cutting and grinding (view larger). 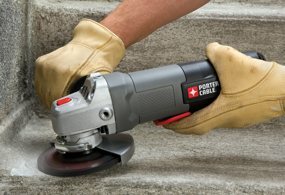 Designed for aggressive performance, the PORTER-CABLE PC60TPAG 4-1/2-inch small angle grinder/cut-off tool offers a compact, lightweight platform to professionals who are looking for corded power on the job site. 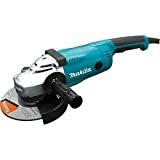 It’s ideal for contractors, welders, fabricators, masons, and other tradesmen whose work includes grinding, metal cutting, polishing, and tuckpointing. One of the lightest grinders on the market at just 4.1 pounds, the PC60TPAG’s 7 amp motor delivers up to 11,000 RPM for tough jobsite applications while the cast metal gear housing helps to dissipate heat, ensuring that it will stand up to the demands of today’s worksite. In addition to a three-position handle for ease of use and positioning for a variety of applications, the PC60TPAG also offers a comfortable and convenient paddle switch that provides additional control by automatically shutting off if dropped. Slim body, paddle grip (view larger). 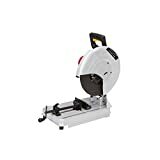 With more and more job sites using a traditional grinder with a cut off guard for cutting metal, the PC60TPAG includes a grinding guard and cutting guard. The two guards are tool-free and can be easily adjusted to control the spark path, increasing productivity and safety on the jobsite. 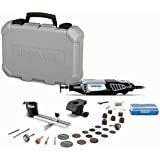 Additional accessories include a side handle, grinding wheel, cut-off wheel, and a wrench. 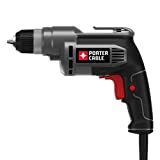 This PORTER-CABLE tool is backed by three-year limited warranty covering any defects due to faulty materials or workmanship (from the date of purchase). It’s also covered by Porter-Cable’s one-year free service contract, where Porter-Cable will maintain the tool and replace worn parts caused by normal use–for free. Versatility for the job site (view larger). 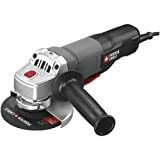 The G12SR4 4 1/2″ Angle Grinder removes casting fin, finishes various types of steel, bronze and aluminum materials and castings, grinds welded sections, sections cut by means of an acetylene torch, synthetic resins, slate, brick and marble. With it’s small grip diameter, high output power and overload durability, it delivers great performance. This grinder comes with 5 grinding wheels and a carrying case. Includes Wheel Guard (338848), Side Handle (302142), Spanner Wrench (938332Z), Case (339264), Abrasive Depressed Center Wheels (5pcs). 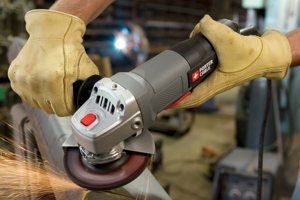 Thin line motor housing for easy grinding of longer materials and a large, independently operable lamp for illuminating set up and grinding operations make the 1/6 horsepower 6-Inch Bench Grinder a perfect choice to add to your tool collection. Tool features a lighted on/off rocker switch, and includes one 36 grit and one 60 grit wheel for grinding a wide variety of projects. The large, cast Iron base reduces vibration and provides stability during use. Wide, clear eye shields are supported by sturdy spark guards for safe operation. Designed for high-performance job sites, the PORTER-CABLE PC600D 3/8-inch variable speed drill provides reliable power and durability for projects requiring extended tool usage. With a high-output, 6.0 amp motor capable of 0 to 2, 500 revolutions-per-minute (RPM), the PC600D 3/8-inch drill is designed to provide the speed needed for a variety of drilling applications. 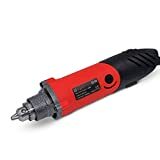 The high-torque gear design makes the drill ideal for metal and wood fabrication, pilot hole drilling in deck building or frame construction, and other applications requiring the extended run-time of a corded drill. This Speedway 3/8″ Variable Speed Reversible Drill has up to 3,000 RPM to give you the power needed for driving and drilling. It is great for metalworking, woodworking and home repairs. It features a large trigger switch for easy operation. No Garage or home tool bag should be without the Speedway 3/8″ Variable speed reversible Drill. The Makita DS4012 has all ball bearing construction for durability and longer tool life. The heavy duty industrial 1/2″ drill chuck is engineered for positive bit retention. It has on board chuck kit storage for fast and convenient bit changes. It is double insulated. 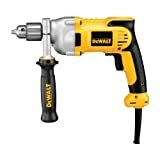 Ideal for mixing drywall mud, plaster and drilling large holes. Delivers increased drilling performance and increased overload protection for added durability. 0-1250 RPM (revolutions per minute), variable speed reversing switch for increased versatility. 980 UWO (unit watts out). 1/2″ Keyed chuck for greater bit retention. 360 deg (Degree) locking side handle for greater control and versatility. Anti-slip Soft grip handle and two-finger trigger for increased comfort. Metal gear housing for jobsite durability and increased reliability. 4.9 lb. (Pound). 3 year limited warranty. This product is manufactured in Mexico. This product meets customer requirement. 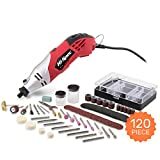 ●GOXAWEE Variable Speed Die Grinder is 100% brand new and high quality. ●6 step Variable Speed from 8,000 to 32,000 rpm for differenet situation. Low speed for cleaning applications and using brush accessories; High speed for routing, cutting and sanding for providing maximum control and precision. ●Wide Application: Ideal for a Variety of Around-the-House, workshop, jobsite and Crafting Projects, Great for a range of DIY, hobby, wood & craft, Jewellery cleaning / polishing. ●Good Choice for DIY: High working efficiency, wide and flexible application and make the job easier. ♥ GOXAWEE Tool ♥ is the source for hard-to-find mini tools for crafts and hobbies. We take great pride in providing the best customer service in America. Whether you are a professional craftsman, a robot builder, or a model building hobbyist who requires precision small tools and micro tools, GOXAWEE Tool can help. 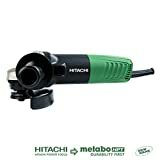 This high speed electric die grinder is great for grinding, sanding, honing, polishing or machining material. Permanent magnet motor with variable speed control; infinite speed selection within the machine’s three speed ranges (0-5000, 0-6500, and 0-8500 RPM); accommodates drills from 0.79 to 6mm DIA. (1/4″); electrical 110 vac, 60 Hz; max. Chuck capacity 6mm; Spindle travel 1″; Column DIA. 1.250″; work surface 6.750″ x 6.750″; throat 4″; overall height 13.5″; width 7.5″; depth 10″; chuck key included. Cutting, Grinding, Sanding, Polishing, Sharpening, Engraving, Drilling, Deburring, Grinding and more!